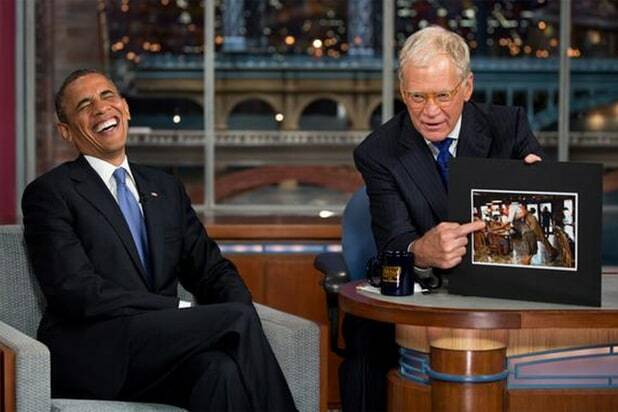 President Barack Obama took to Twitter to honor David Letterman on Wednesday, the night of the “Late Show” host’s final broadcast. “TV won’t be the same without Dave,” Obama said from his @BarackObama account and included a photo from his appearance on the show. A photo within the photo showed Florida pizza parlor owner Scott Van Duzer embracing Obama in 2012 and lifting the president off the ground. Obama became the first sitting president to appear on Letterman’s show on Sept. 21, 2009, and also appeared on the show Sept. 18, 2012 and most recently on May 4. “Dave, let me just say this,” he said in his last appearance, “and I mean this sincerely, and I know I speak for Michelle — she probably had a chance to say it herself — you know, we’ve grown up with you. “The country I think has, you know, after a tough day at the office or coming home from work, knowing you’ve been there to give us a little bit of joy, a little bit of laughter, it has meant so much, and you’re part of all of us … you’ve given us a great gift, and we love you,” he added. Michelle Obama visited the show the week prior and offered to help Letterman raise his children. “I could help you through those dark times,” she said.